The Victorian Era was a pretty weird time to be alive when it comes to photography. During that time, the practice of post-mortem photography (which is, photographing the deceased) was pretty common. Today, that would be seen as morbid and people would freak out, but at the time it was seen as acceptable. These are some of the most unsettling examples of Victorian post-mortem photography we could find. 1.) 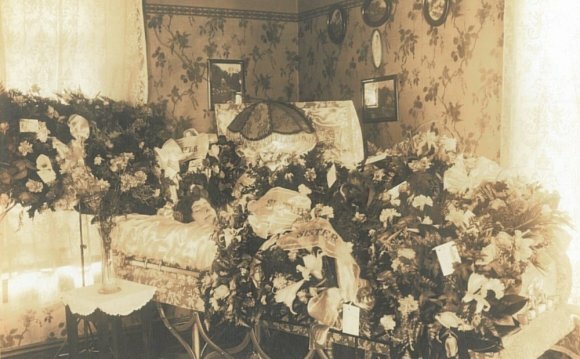 The photos weren’t seen as creepy at the time, they were meant to serve as mementos of the deceased for their family. 2.) And that is why many photographers tried to make their dead subjects look alive. 3.) Photographers tried different tricks to make the deceased look more life-like. 4.) One of their tricks was posing people with some of their favorite things (like this gentleman, who is in a chair with his dogs). 5.) Or this little girl here with her toys. 6.) Another trick photographers used, was to make it look like the dead person was actually sleeping. 7.) Sometimes they used elements, like in this case. Here, the dead girl at the end is being propped up with a special device. 8.) In this case, the photographer positioned the man’s arm in a way that would support his head. 9.) See the odd position of the curtain behind the little boy? There was probably someone behind him holding his head up. 10.) Here this little girl happens to be sitting sideways so that the device propping her up cannot be seen. 11.) This girl almost looks alive in this picture. 12.) Notice anything weird about the background? Well, this girl is sitting on someone’s lap. The person was holding her in place while the photo was taken. 13.) In this photo, the girl who is standing in the middle is the deceased. This time, the photographer attempted to make her look alive by drawing eyes on her pupils. 14.) There were other times when it just wasn’t possible to make their subjects look alive. 15.) It was common practice for family members to pose with their dead loved ones for these photographs. 16.) You can see it wasn’t easy for the living families members. The pain you can see in these parents’ faces as they hold their dead child is pretty obvious. 17.) At the time, the photography process was slow and you had to be still for the photo to be successful. 18.) In this photo, the dead girl is in focus while her parents are not, as they probably moved while the photograph was being taken. 19.) There is something quite captivating about her eyes in this photograph.